While working with different functionalities ; the oracle developers are facing different types of errors.The most common error coming while connecting database is ORA-12154: TNS:could not resolve the connect identifier specified .In this article i will explain how ORA-12154 error will solve and why this error will come.This is the most common error and most searched error by developers and DBAs.This error will come while trying to establish connection first time.So this is most common error in oracle. The error is displayed in the above images. Why ORA-12154 error will come? When Application tries to connect with database. When one database will try to connect with other database via database link. Just after installing the oracle database and tries to connect system user. In above situations this error will occur.There should be multiple reasons for this error.The following should be the reasons of this error. So If this error will come then DBA or developer needs to do first check i.e. tnsnames.ora. Make sure that the service name we are using is the same for which the listener is listening for. 4.Your Service name might have an alias.Check that in global entries as well as local entries. 5.Check for global_name settings with SQL. This query value should match the init.ora parameters db_name and db_value. If the value is not matching you can change that value using alter command of database. Kindly check the tnsnames.ora file is present in specified location or not. Make sure that tnsnames is listed as one of the values of the names.directory_path parameter in the sqlnet.ora Oracle Net profile. Check for the syntax errors in tnsnames.ora file.If there is error in this file then this file is unusable. If you are using instant client method rather than tnsnames.ora file then database attribute name needs an connect URL rather than service name. Where host is the host_name or ip address and port will be the oracle port and service name is the service name specified. 1.LDAP must be there in names.directory_path parameter of sqlnet.ora file. 2.Verify LDAP directory server is up and accessible. 3.Verify that service name and database name is configured in directory or not. 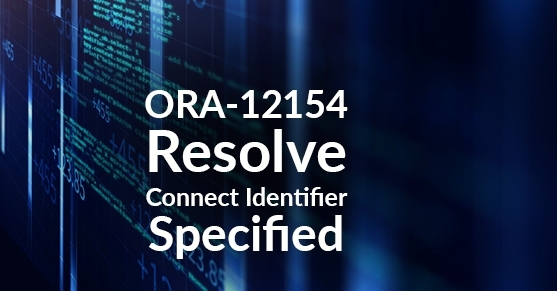 I have specified some ways to resolve the error ‘ORA-12154: TNS:could not resolve the connect identifier specified’ which is frequent error on Oracle. Hope you like this article.If you like this article don’t forget to share it.